Visit The Mercury 13 Exhibit at the Woodbourne Library in Centerville. Learn more about The Mercury 13: The little-known story of the thirteen women who went through secret testing during the 1960s to prove that women could be astronauts, only to have the program shut down by Congress. 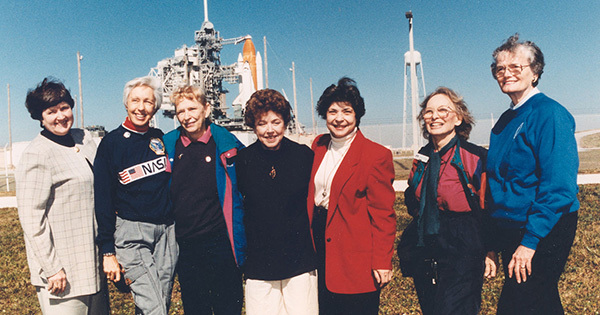 This exhibit, on loan from the International Women’s Air and Space Museum, will be on display at Woodbourne Library March 29 thru April 22, 2019. The exhibit is open during regular library hours. Photo (right) credit NASA (public domain): Jerrie Cobb with a Mercury capsule | Photo (cover) credit NASA (public domain): Seven surviving FLATS attending the STS-63 launch. (from left): Gene Nora Jessen, Wally Funk, Jerrie Cobb, Jerri Truhill, Sarah Rutley, Myrtle Cagle and Bernice Steadman. Find more events like "The Mercury 13 Exhibit"